Base license for stackable FortiManager-VM. Manages up to 10 Fortinet devices/Virtual Domains Domains, 1 GB/Day of Logs and 100 GB storage capacity. Designed for VMware vSphere, Xen, KVM and Hyper-V platforms. FortiManager virtual appliances offer the same powerful management features as FortiManager hardware-based appliances, with the addition of a stackable license model that enables easy growth with your network environment. Fortinet virtual appliances allow you to deploy a mix of hardware and virtual appliances, operating together and managed from a common centralized FortiManager platform. Integrated FortiAnalyzer Logging This allows for a tighter integration and correlation of events and policies. A consolidated platform allows customers to more easily deploy Fortinet management products. Hierarchical Objects Database Facilitates reuse of common configurations across the organization in both local and global ADOM levels. 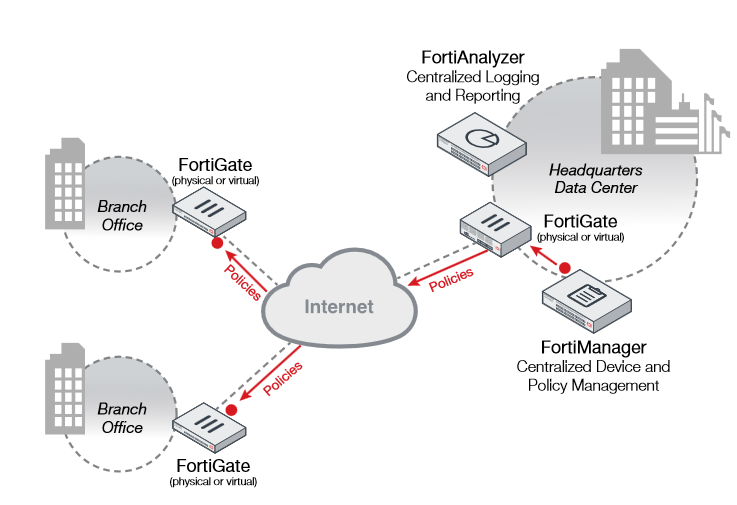 Automated Device Provisioning / Centralized Policy Configuration Reduces cost of deploying new FortiGate or FortiClient installations and maintains policies across all managed assets. Role-Based Administration Enables distributed administration, an important requirement for larger organizations. Policy/Device Auditing Allows you to prove compliance, and track any deviations from the required security policy. In-view Policy Object Editing Faster rulebase editing without opening new windows or changing context. Device Profiles Aids in mass provisioning of managed devices. * Limited in software to 10,000 devices. Real-time monitoring and integrated basic reporting provide visibility into network and user activity. 3 Storage Capacity and GB/Day of Logs are not stackable. These values represent the maximum available with purchased license. Upgrade license for adding 10 Fortinet devices/Virtual Domains Domains; allows for total of 2 GB/Day of Logs and 200 GB storage capacity. Upgrade license for adding 1,000 Fortinet devices/Virtual Domains Domains; allows for total of 10 GB/Day of Logs and 4 TB storage capacity. Upgrade license for adding 5,000 Fortinet devices/Virtual Domains Domains; allows for total of 25 GB/Day of Logs and 8 TB storage capacity.